Rural post offices may remain open with shorter hours under a new plan announced by the U.S. Postal Service on Wednesday. WASHINGTON (CNNMoney) -- The U.S. Postal Service is backing off a previous plan to close thousands of post offices, and will instead cut hours at 13,000 rural facilities in an effort to save $500 million a year. In response to a backlash against massive closures, the Postal Service said Wednesday it will cut hours at the targeted post offices, which would remain open between two hours and six hours a day. In addition, thousands of employees will be impacted when jobs shift from full-time to part-time positions. The announcement is part of a broader plan that aims to save rural post offices from closing. The Post Office plans to allow rural communities to choose whether their local post office will remain open with shorter hours, become a "village post office" that's operated through a private company, or close altogether. Most communities will choose shorter hours to keep their post office open, Postal Service officials say. "Any rural community that wants to retain a rural post office, we'll work with them to do that," said Patrick Donahoe, the postmaster general. The plan to introduce shorter hours would happen over the next two years and be completed by September 2014, according to the postal service. The new plan also includes buyout packages to be offered to 21,000 postmasters -- the people in charge of post offices -- eligible for retirement in offices throughout the nation, not just in rural areas. The cash buyouts will run up to $20,000 over a two-year period. The Postal Service is in a financial bind, facing a $5.1 billion loss last year, due to the recession, declining mail volume and a congressional mandate to prefund retirement health care benefits. The agency has said it wants to cut Saturday service, delay mail delivery and close hundreds of postal processing plants triggering thousands of job cuts nationwide. Under the new plan, some 500 postal offices that have been closed over the last two years will remain closed. Another 400 post offices that were ready to be closed when the May 15 moratorium on closures expires will now remain open while communities have an opportunity to decide what they'd like. The news came as a relief to many lawmakers in the Senate who had spent the past few weeks lobbying the Postal Service to keep post offices open until legislation to save the post office got completed. 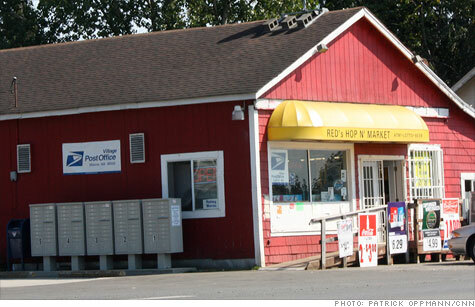 Much of the Senate bill made it very difficult to close rural post offices. "The Postal Service's plan gives local communities a voice in ensuring that essential postal services are preserved," said Thomas Carper, a Delaware Democrat who is one of the authors of the Senate postal bill. House Republicans were not impressed with the meager savings on the plan to curtail rural post office hours, especially compared to the $12 billion debt that the Postal Service has racked up in loans from the Treasury Department. "To achieve real savings creating long-term solvency, the Postal Service needs to focus on consolidation in more populated areas where the greatest opportunities for cost reduction exist," said Rep. Darrell Issa of California, author of the House plan to save the service.